Bhakti-ratnakara, written by Sri Narahari Cakravati, who was also known as Ghanasyama dasa, is a very respected and authorized literature describing the lives of the devotees after the disappearance of Sri Caitanya Mahaprabhu. It especially illuminates the glories of the great acaryas, Srinivasa Acarya and Narottama dasa Thakura. By reading Bhakti-ratnakara, we can vividly experience the mood of the times after the disppearance of Sri Caitanya Mahaprabhu, and how the leading devotees endeavored to spread the Lord's teachings, especially in Bengal. In this wonderful book, you will read many fascinating pastimes of Sri Jahnava-devi, her son, Viracandra Prabhu. Read about Gopala Bhatta Gosvami, how he established the Radharamana temple in Vrndavana. There is also a wonderful tour of Navadvipa given by Isana Thakura, wherein he describes many confidential pastimes of Lord Caitanya in His early years. We should pray in the manner of the author, who says, "Give me the mercy that I will be always plunged in the jewel-filled ocean of devotional service (bhakti-ratnakara). Aside from the interesting history and the innumerable incidents described in this wonderful literature, it is very enlightening to imbibe the mood of how the devotees related to one another. The author, Narahari Cakravarti, although an exalted devotee, repeatedly described himself as a worthless person, no better than a pile of ashes. Lord Caitanya had in instructed that one should feel himself lower than the straw in the street and more tolerant than a tree. When we hear of the pastimes of the Lord and His devotees from such a humble personality, it acts to purify our hearts. Besides the author, we see the wonderful humility displayed by all the exalted devotees of Sri Caitanya Mahaprabhu. How respectfully they spoke to one another and how respectfully they treated each other. Lord Caitanya also said that we should offer al respect to others and expect no respect for ourselves. This wonderful literary work stands as proof and serves as inspiration, for in its pages we find how it was that in the day to day lives of these great devotees, these principles were lived as a practical reality. It was very difficult for associates of Sri Caitanya Mahaprabhu to maintain their lives after his disappearance. And, it became even more difficult for the remaining associates of the Lord after Sri Caitanya Mahaprabhu's great associates departed, especially Srila Rupa Gosvami and Srila Sanatana Gosvami. In Bhakti-ratnakara, there are many times when young devotees are faced with the devastation of the passing on their very support, the Lord's personal associates. In each case, the devastated devotees would receive reassurances by the Lord's associates that remained, as well as from appearance of the departed great souls in their dreams. From these numerous example we understand the Lord's desire that His message are meant to be distributed to the people of the world and that those who continue to engage in such welfare work are assured of the Lord's direct association in the very near future. Let us read this wonderful literature and take a trip to Vindavana, along with Jahanava-devi, the exalted wife of Nityananda Prabhu. Let us journey to Jagannatha Puri with Srinivasa Acarya. 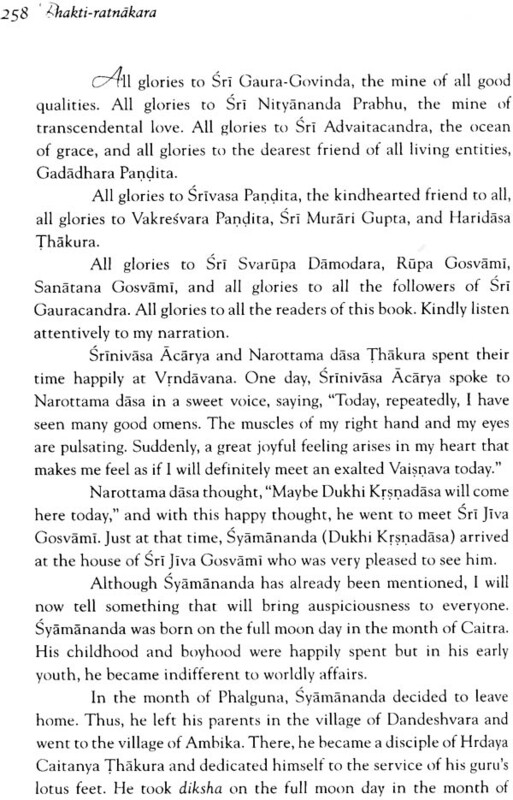 Let us hear the letters of Srila Jiva Gosvami sent to Srinivasa Acarya. Let us take a guided tour of Vraja-mandala with Raghava Pandita and a tour of Navadvipa with Isana Thakura. These and many more await us in the pages of this book. Bhakti-ratnakara, written by Sri Narahari Cakravarti, who was also known as Ghanasyama dasa, is a very respected and authorized literature describing the lives of the devotees after the disappearance of Sri Caitanya Mahaprabhu. It especially illuminates the glories of the great acaryas, Srinivasa Acarya and Narottama dasa Thakura. 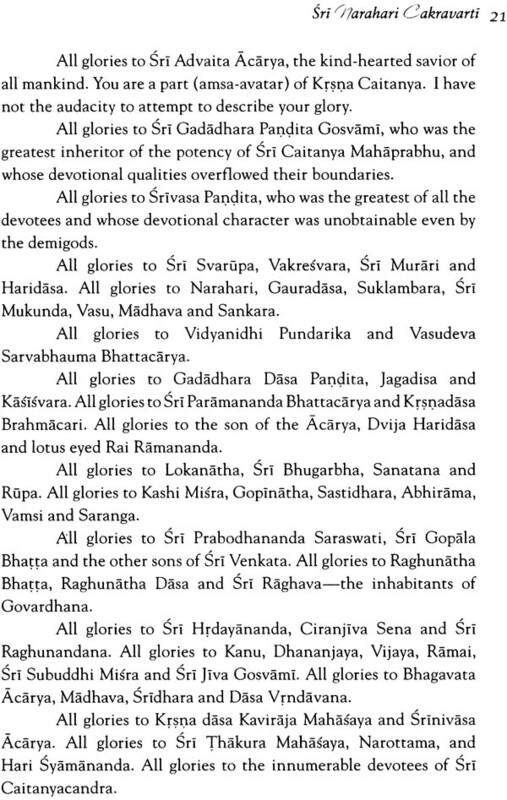 In his books, Srila Prabhupada quoted Bhakti-ratnakara many, many times, as did the previous acaryas. "Srila Bhaktisiddhanta Sarasvati Thakura, in his Anubhasya, has given the following note in connection with the village Kuliya. The village originally known as Kuliya has developed into what is now the city of Navadvipa. In various authorized books like the Bhakti-ratnakara, Caitanya-carita-mahakavya, Caitanya-candrodayanataka and caitanaya-bhagavata it is mentioned that the village of Kuliya is on the western side of the Ganges. Even now, within the area known as Koladvipa, there is a place known as kuliara ganja and a place called kuliara daha, both within the jurisdiction of the present municipality of Navadvipa. In time of Lord Caitanaya Mahaprabhu, the two villages on the western side of the Ganges named Kuliya and Pahadapura both belonged to the jurisdiction of Bahiradvipa. At that time the place on the eastern side of the Ganges now known as Antardvipa was known as Navadvipa. At that time the place on the eastern side of the Ganges now known as Antardvipa was known as Navadvipa." By reading Bhakti-ratnakara, we can vividly experience the mood of the times after the disppearance of Sri Caitanya Mahaprabhu, and how the leading devotees endeavored to spread the Lord's teachings, especially in Bengal. 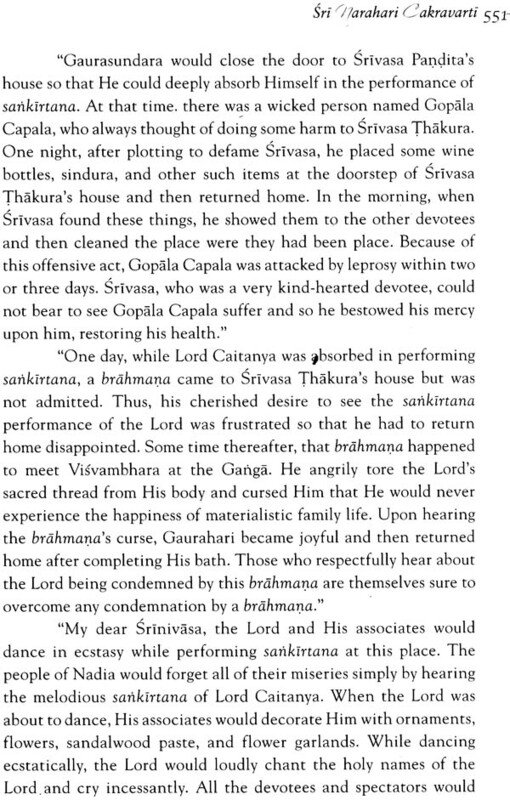 It was very difficult for associates of Sri caitanya Mahaprabhu to maintain their lives after his disappearance. And, it became even more difficult for the remaining associates of the Lord after Sri Caitanya Mahaprabhu's great associates departed, especially Srila Rupa Gosvami and Srila Sanatana Gosvami. In this wonderful book, you will read many fascinating pastimes of Sri Jahnava-devi, her son, Viracandra Prabhu, and numerous other exalted devotees. 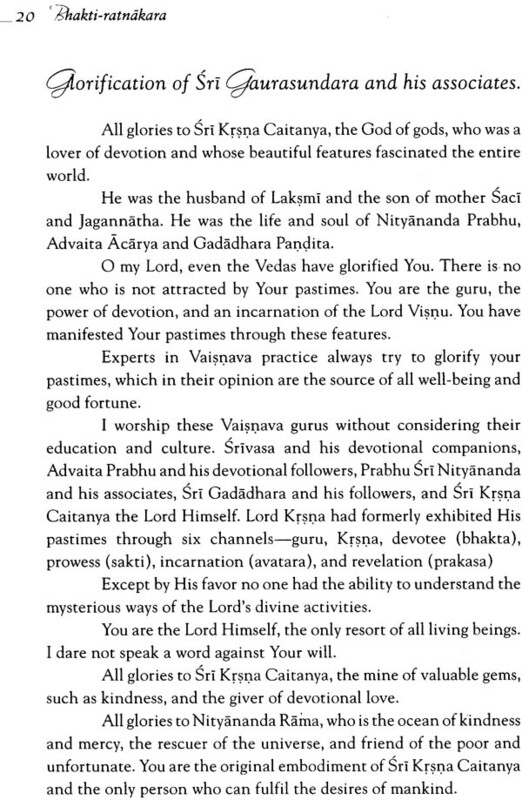 There is a wonderful tour of Navadvipa given by Isana Thakura to Srinivasa Acarya and Narottam dasa Thakura, wherein he describeds many confidential pastimes of Lord Caitanya in His early years. It is a fact that this wonderful book contains much invaluable information about the Lord and His associates. In a purport to the Sri Caitanya-caritamrta, Srila Prabhupada recommends: "The son of Venkata Bhatta was later known in the Gaudiya-sampradaya as Gopala Bhatta Gosvami, and he established the Radharamana temple in Vrndavana. More information about him may be found in a book known as the Bhakti-ratnakara, by Narahari Cakravarti." Aside from the interesting history and the innumerable incidents described in this wonderful literature, I find it very enlightening to imbibe the mood of how the devotees related to one another. For example, the author, Narahari Cakravarti, although an exalted devotee, repeatedly describes himself as a worthless person, no better than a pile of ashes. Lord Caitanya had instructed that one should feel himself lower than the straw in the street and more tolerant than a tree. When we hear of the pastimes of the Lord and His devotees from such a humble personality, it acts to purify our hearts. Besides the author, we see the wonderful humility displayed by all the exalted devotees of Sri Caitanya Mahaprabhu. How respectfully they spoke to one another and how respectfully they treated each other! Lord Caitanya also said that we should offer all respect to others and expect o respect for ourselves. Here in this book, we see how, in the day to day lives of these great devotees, these principles were lived as a practical reality. Aren't humility and respect manifestations of the same elevated devotional mood? One who is humble will easily offer respect to others and not expect respect for himself. One who is proud will naturally disrespect others and demand a lot of respect for himself. Therefore, especially in the association of devotees, we should be very eager to advance ourselves in terms of humility and respectful behavior toward others. By reading Bhakti-ratnakara, we can see how devotees should live together in Krsna conscious association. Of course, the devotees described in this book are not oridinary persons, as we may be, but still, their example is always to be emulated. Srila Prabhupada always tried to guide us in the right direction and for this purpose, he taught us to offer obeisances to one another and address each other as Prabhu. Those of us who were present at the time of Srila Prabhupada's disappearance know very well the devastating effect it had upon us. We can therefore just imagine the effect that the disappearance of Lord Caitanya had upon his associates. This book very vividly gives us a view of this but not only that, it gives us an account of how these devotees received inspiration so that they could carry on enthusiastically with the Lord's preaching mission. In Bhakti-ratnakara, there are many times when young devotees are faced with the devastation of the passing of their very support, the Lord's personal associates. In each case, the devastated devotees would receive reassurances by the Lord's associates that remained, as well as from appearance of the departed great souls in their dreams. From these numerous example we understand the Lord's desire that his messages are meant to be distributed to the people of the world and that those who continue to engage in such welfare work are assured of the Lord's direct association in the very near future. Let us read this wonderful literature and take a trip to Vrndavana, along with Jahnava-devi, the exalted wife of Nityananda Prabhu. Let us journey to jagannatha Puri with Srinivasa Acharya. Let us take a guided tour of Vraja-mandala with Raghava Pandita and a tour of Navadvipa with Isana Thakura. These and many more await us in the pages of this book. We should pray in the manner of the author, who says, "Give me the mercy that I will be always plunged in the jewel-filled ocean of devotional service (bhakti-ratnakra). This book certainly is an ocean filled with jewels of devotional service and it was a great transcendental pleasure to edit it. My only regret is that my work is now finished so that my mind will no doubt turn towards lesser pursuits. I sincerely hope that the readers of this book will derive similar transcendental pleasure and continue to do so in the future. How Vipra Caitanya dasa went to Nilacala and attained the fulfillment of his desire. A description of Srinivasa's birth, and an elaborate description of his father and sons. 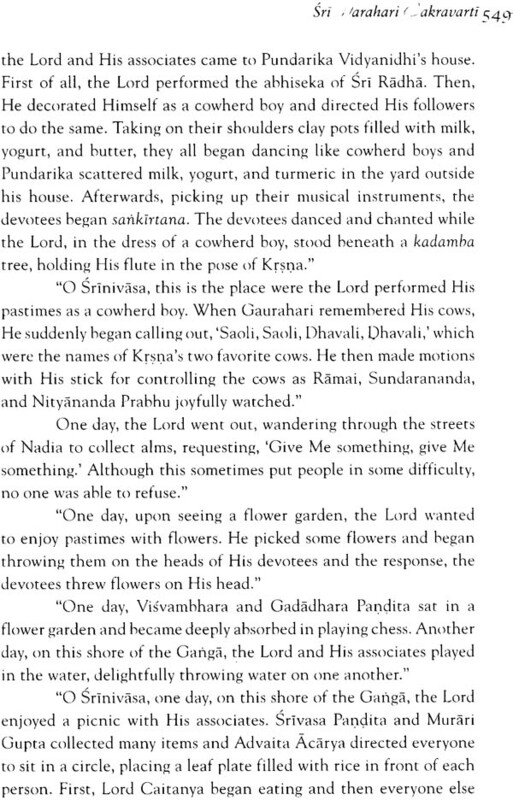 The story of how the Deity, Govinda, was manifested in Vrndavana. How Srinivasa went to Nilacala. Hearing that Lord Caitanya had disappeared from this world, Srinivasa felt that he was burning in great flames of sorrow. 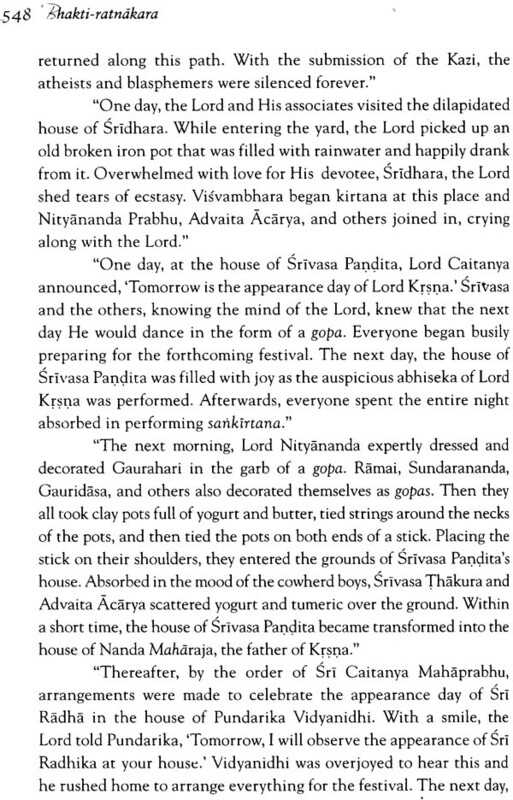 Srinivasa then went to Nilacala. In a dream, Lord Caitanya gave him instructions. The Lord's personal associates gave mercy to him. Srinivasa then returned to Gauda-desa. Srinivasa Acarya traveled in Gauda-desa. There, he received great mercy from Visnupriya. The Lord's associates also gave mercy to him. 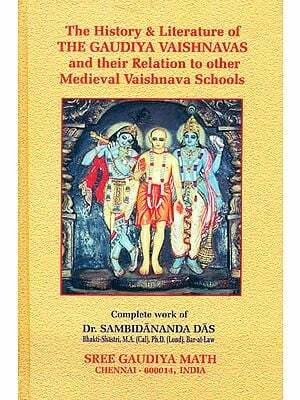 Srinivasa's travels to Vrndavana and other places is also described. In Sri Raghava's company, Srinivasa and Narottama toured Vraja. Sri Sri Gaura-Nityananda's pastimes and many other topics are also described here. 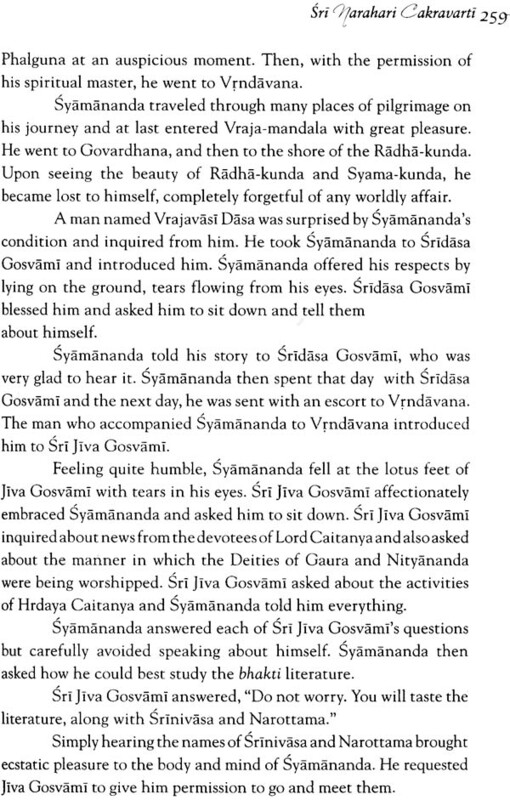 Sri Syamananda went to Vraja. He became very attached to the Deities, Madana-Gopala and Govinda. Then, taking the Gosvamis books with him, Srinivasa departed for Gauda-desa. The Gosvamis books were stolen in Visnupura. Then, Srinivasa acarya gave mercy to king vira hamvira. Sri Syamananda then went to Orissa. Here are many descriptions that are nectar for the ears. Sri Narottama Thakura Mahasaya traveled in Gauda-desa and then traveled to Nilacala. 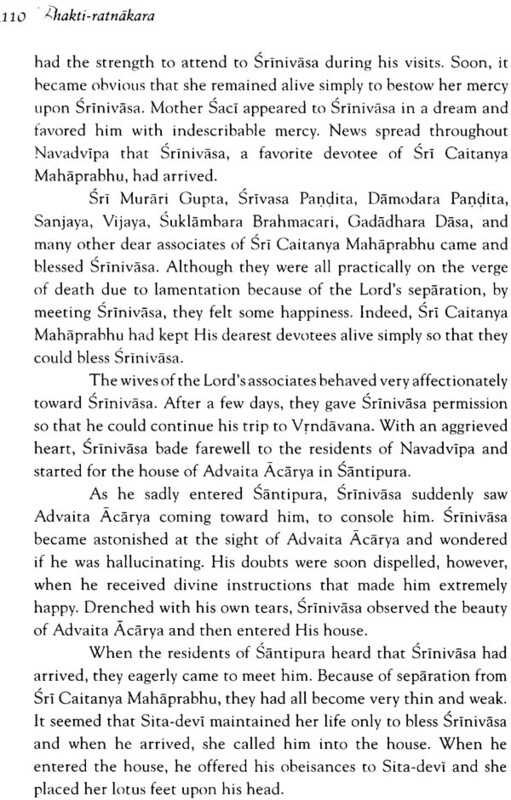 Departing from Nilacala, he met Srinivasa Acarya. Ramacandra and others became disciples of Srinivasa Acarya. 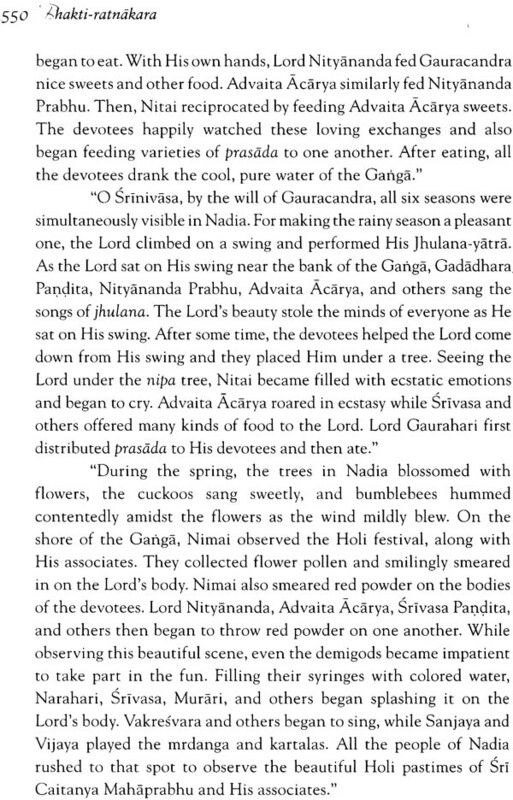 Srinivasa Acarya taught the Gosvamis books and then returned to Vrndavana. The great festival at Kancanagaida Village. In Sri Khetarigrama was a very great festival. 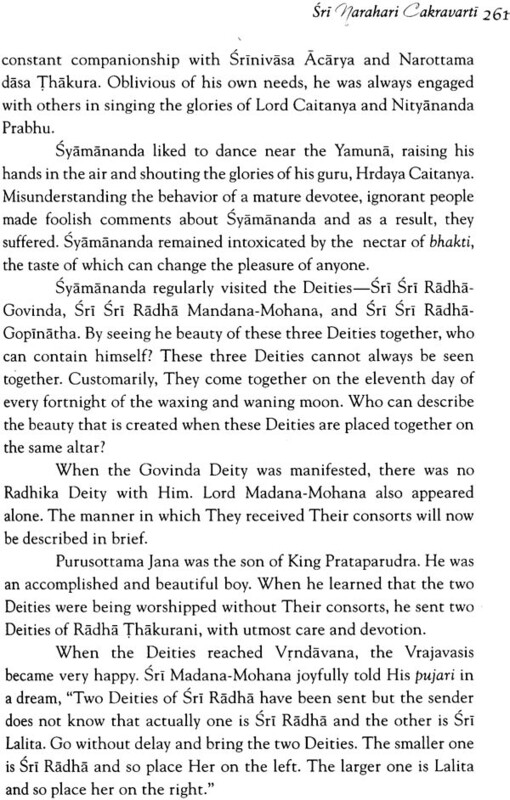 The Lord's associates danced in a kirtana of Lord Gaura's holy names. Sri Jahnavi Isvari departed from Vraja and arrived at Khetari-grama. Isvari then went to Ekacakra-grama, made a Deity, and then went to Kadadaha. The three devotees headed by Srinivasa traveled to Nadiya with Isana. In this context are many delightful stories, beginning with the story of Lord Nityananda's wedding. Srinivasa Acarya was married for a second time These activities are certainly wonderful. Then, Prabhu Viracandra was joyfully married. Accompanied by His companions, He went to Vraja and then returned to Gauda-desa. Srinivasa Acarya, accompanied by his associates, celebrated a very great festival in Borakuli-grama. In that festival, everyone was plunged in the ocean of sankirtana. Of this festival there are many charming stories. Syamananda joyfully enjoyed pastimes with his associates in Orissa. To the great blasphemers, Syamananda gave the gift of devotional service.